Life According to Steph: To brine or not to brine? Let's talk turkey. Every year my Grandmom made Thanksgiving turkey. No brine. Every turkey my mom made, no brine. So for the early part of my adult cooking life, I was firmly entrenched in the no brine camp. Then I decided to try brine, and I'm not going back. It brings a flavorful succulence to the turkey that is sometimes missing otherwise. When you roast a beastly bird for a few hours, it's bound to lose some moisture. When you brine before roasting, it counteracts that. I now brine other poultry and meats too, using this same basic recipe that I got from Savory Sweet Life. Note: You do NOT want to brine a kosher or self-basting turkey. It will be like a giant salt lick, your Thanksgiving will be ruined, and everyone will cry because you will be eating hotdogs out of the freezer instead of the much anticipated turkey. Pre-seasoned turkeys? Meh. You can still brine. Just cut the brine time down by half or more. Bring four cups of water to a simmering boil. Add salt and sugar. Stir until totally dissolved. Remove from heat. Stir in eight cups cold water and the rest of the ingredients. Set aside. 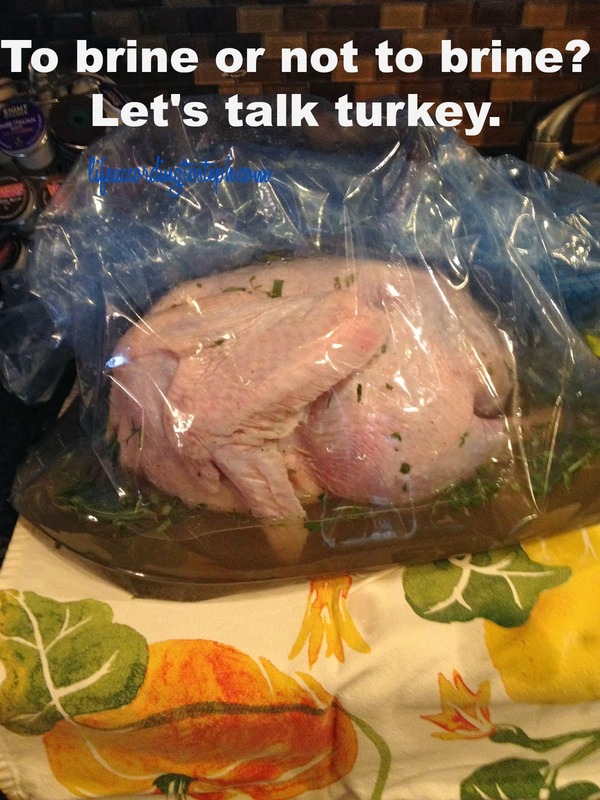 Make sure turkey is totally thawed. I usually thaw it for a day longer than the directions suggest. Remove giblets and neck and rinse the bird thoroughly, inside and out. Pat that baby dry with paper towels. Place the turkey in a large bag - once I used a trash bag, but now I use those large ziploc bags because they are food grade and trash bags are not. Whoops. Pour brine into the bag and put it in the fridge. The minimum amount of time is one hour per pound, turning it halfway so both sides get good and brined. You can go longer than that if you want or need to. When it's time, rinse the turkey inside and out. Pat it with paper towels. From there I like to lather mine with seasoned butter and roast that sucker. What about you? Briner? Not a briner? Brawler? Shot caller? Beastly bird, ha. I have never brined before, the idea of manhandling the beast more than is absolutely necessary has previously put me off. We don't have Thanksgiving here but we do have turkey for Christmas so that may be the time to try this... What do you normally eat for your Christmas lunch? My aunt and uncle make the turkey, which I do not eat so i am not sure what they do. i would totally brine other meat though. Chicken here I come. I love a good brined turkey! And then my mom puts bacon on the top, so good! Sounds like a delicious option!! Love a juicy turkey! I have never brined a turkey. Are they clearly marked as self basting or kosher when you buy them at the supermarket? I brined for the first time this year and I'm so not going back!! I'm considering brining this year! I've never done it, and I've never had a turkey that was brined, but it just sounds so tasty! I guess I'm briner. I've never actually cooked a Thanksgiving turkey but my mom taught me to always brine chicken before I cook it. She never (and I don't either) use any herbs or anything. We would just fill a bowl with cold water and add kosher salt and the chicken. Is this recipe kind of like a mix of brining and marinating then? I like the added herbs that you use. It's enough just making the turkey and the whole shabang! My turkeys are always moist, too. I did brine once. Didn't notice the difference. I will be making a bird next week for sure, probably Tuesday or Wednesday since I am not cooking on Thursday. I love the white meat and pan dripping gravy. I've never done this, but definitely trying it this year! Baller, shot caller... oh wait... Briner for sure. I have done it both ways and it just seems juicier when you brine. I am ready to pig out!!! First time I actually DID the work, I used a huge pot instead of a bag... what a mess in the fridge! So i had my Thanksgiving this past weekend and it was so good. Brine the turkey was a good choice! Mmmm turkey!!! I have not cooked a turkey on my own yet, but I think after reading this I would have to brine! Brawler/shot caller.... hahahaha. I've attempted to cook a turkey exactly once in my life. It went to horribly awry that I wound up having Chinese food for Thanksgiving. Luckily it was only me and my mom, and she didn't care. However if i were to try again, I would probably really go for it and brine- the juicier the turkey, the better! I've never made a turkey before, and while I don't plan to start this year. I'm seriously considering it for next year, so I will keep the magic of the brine in mind. I can't remember the last time that we actually cooked a turkey in the oven. We've gotten to the point that we only eat fried turkey on Thanksgiving and Christmas and it's amazing! Plus it means more oven space for sides and makes the men actually help out and not sit inside not doing anything all day. Bahahaha... shot caller. I love it! I've never attempted to brine before. Actually we have an oil-free turkey fryer that takes about 1.5 hours to cook a large turkey so I just skip all the dirty work. I do cheat and inject with creole seasonings. Yummy brine solution! I brined once but it was just salt. And I haven't had to make a turkey since. Not the worst thing. So, what do you do with the ice? Make a margarita?? LOL. I don't see it in your steps :). Aaron is devoted to brining. It really does make such a difference! And we have an oil-less fryer, but still brine. super interesting! to be honest, i never knew what brine was but now i understand. maybe one day i will try and cook a turkey. perhaps i should try a chicken first?